Lee, Robert Stanley "Stan" - Age 76, of Fenton, died January 15, 2019. Services will be held 1 PM Monday, January 21 at Sharp Funeral Homes, Fenton Chapel, 1000 Silver Lake Road, Fenton, Chaplain Bob Clark officiating. Visitation will be held 11 AM until the time of the service Monday. Those desiring may make contributions to the Fenton Fire Department Children's Fire Safety Education Fund. Stan was born January 21, 1942 in Flint the son of Robert E. Lee and Erma Ruth (Symons) Schmuck. 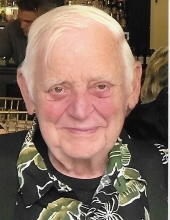 He was a lifelong resident of Fenton and 1961 graduate of Fenton High School. He married Mary L. (Hurst) Doherty-Lee on August 17, 1991 in Fenton. Stan retired from General Motors in 1993 with 30 years of service. He was a firefighter with the City of Fenton with 37 years of service. Stan volunteered with the Red Cross, he served in New York for 9/11 disaster and helped with multiple natural disasters. He enjoyed wood carving, amateur Hamm radio, and traveling in their motor home. Surviving are: wife of 27 years Mary; children, Daniel (Lisa) Lee of Taylor, Tracy (Andy) Smith of Grand Blanc, Randy (Kim) Lee of Swartz Creek, Elizabeth (Steven) Matz of Holly, Tom (Jeannie) Doherty of Midland, John (Margie) Doherty of Linden; 13 grandchildren, 7 great-grandchildren; siblings, Mick (Kelley) Lee, Dan (Fran) Schmuck, Becca Harrington; several nieces and nephews. He was preceded in death by his parents, first wife, Judith Lee; brother Jeff Lee, stepfather, Bob Schmuck; and stepmother, Olga Lee. Tributes may be shared on the obituaries page of www.sharpfuneralhomes.com. To send flowers or a remembrance gift to the family of Robert Stanley "Stan" Lee, please visit our Tribute Store. "Email Address" would like to share the life celebration of Robert Stanley "Stan" Lee. Click on the "link" to go to share a favorite memory or leave a condolence message for the family.